KEW is the most leading manufacturer for Pneumatic Brake in India. The offered range of products is widely used to experience and understand the web psychology and behavior. Our products are manufactured and designed using high-quality material and cutting-edge technology for the better development of our products. All type of Pneumatic Brake with heavy duty process, Electro Magnetic Brake, Pneumatic Brake manufacturer with International Standards and successful installations all over the Globe. Our Brake for Winder Rewinder Machine, Rewinder Unwinder Machine, Slitter Rewinder Machine and many more flexible packing machinery. Brake offers a wide range of torque proportional to air supply from 0.2 psi to max 90 psi. Breaks produced in the largest range of electronic devices to coordinate for ongoing slide stopping programs at method power levels. We offer the widest range of brakes and electronics to match for continuous slip breaking applications at medium power levels. This high-performance, dual disc brakes are characterized by their ability to perform right down to zero speed in open loop or closed loop modes of operation. Pneumatic brakes of various sizes and types are available to fit any applications. They are simple to use, easy to replace worn out brakes pads. Brakes come fully assembled, ready to fit and easy mounting. 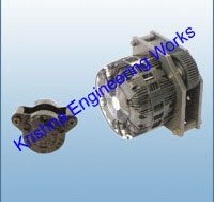 These brakes are mainly used as actuators for Un- winder applications. Krishna Engineering Works is a company incorporated by experts having vast experience of 25 years in the Engineering industries of Plastic Packaging - Converting, Textile Processing and Tyre - Cord machineries. Our founders have a deep technical & marketing knowledge in these industries. The company takes regular participation in national, international conference, exhibitions, etc. to continuously update itself with latest technological advances and make available to the market our latest products.